One Ring to rule them all, One Ring to find them, One Ring to bring them all, And in the darkness bind them. The One Ring is cast in sterling silver and richly plated in pure gold, featuring the inscription above in Elvish, an ancient language of Middle-Earth. This inscription is amazingly etched in full circle onto the inside and outside of the ring. 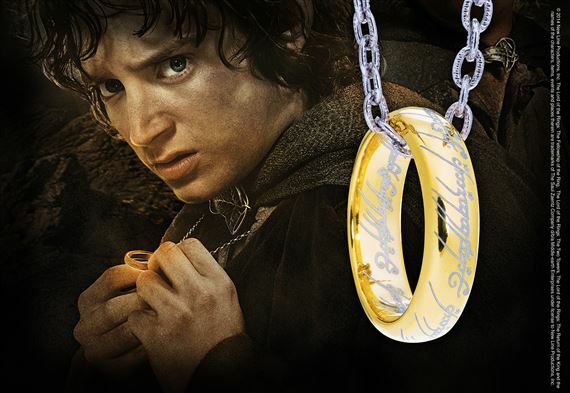 Each ring is individually engraved with a laser process to capture the intricate details of the elvish writing and comes complete with a rich wooden collector's box and 24 inch chain. A certificate of authenticity accompanies this recreation of The One Ring. Available in standard size ten only.